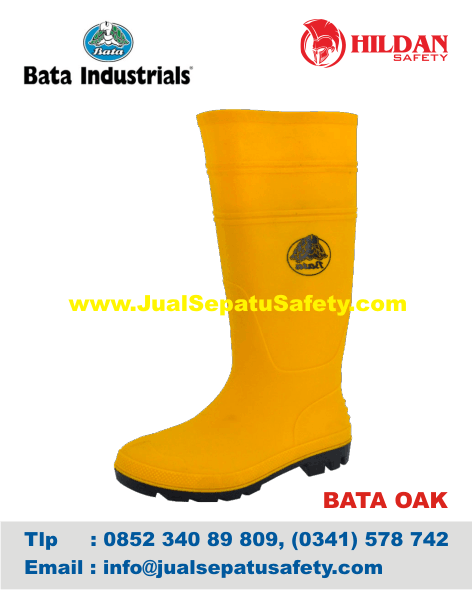 Detail Produk "Sepatu Safety BATA OAK"
The OAK PVC Moulded gumboot is a perfect boot for the Food industry, Construction, Fishing and Agriculture. This remarkable yellow Wellington boot is oil resistant, has an anti-slip sole and is great for wet environments. Gumboots are also known as Wellington boots or rain boots. Gumboots are suited for very wet environments. Gumboots are also known as Wellington boots and rain boots. These work boots made by Bata Industrials are always water resistant. For gumboots it’s very important that they have anti slip features. Wet environments are often slippery, so anti slip protection is a must have. In some occasions gumboots are also used in highly disinfected environments, such as kitchens and butcheries.